Have you figured out what you're dressing up as this year? Every year I attempt to plan ahead and concoct the perfect outfit, but my costume selection always ends up feeling rushed and last minute. However, if you're also looking to feel inspired this season then look no further. Tarte Cosmetics has an amazing collection of products inspired by the show that feels like it's always Halloween: True Blood. True Blood, is of course, the racy, campy and wildly popular HBO series that focuses on the mystical, magical creatures, vampires and humans that are always up to no good in Bon Temps, LA. If you haven't already seen this show, I suggest you carve out some serious sofa time. It's pretty addictive. Tarte for True Blood Limited-Edition Palette ($52.00) Just in time for the ghoulish holiday, Tarte has created a limited-edition palette with 17 new eyeshadows, an Aqua-Gel eyeliner, mascara and eye primer to help you complete the look. The shadows are infused with Amazonian clay which makes them rich, silky and long lasting. The shimmering, matte and smoky shades are all gorgeous and provide a great range in color. The mix of light and dark hues will help transform you into an innocent fairy (i.e. Suki) or a blood sucking vampy vixen (i.e. Jessica) depending on your mood. The palette even comes with instructions by True Blood makeup artist Brigette Myre-Ellis on how to create and achieve four different True Blood looks. Um.. yes please. 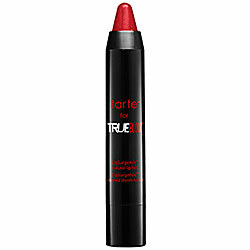 Tarte for True Blood Limited-Edition Natural Cheek Stain ($30.00) Unfortunately you can't do a True Blood collection without some serious crimson-blood red shades. 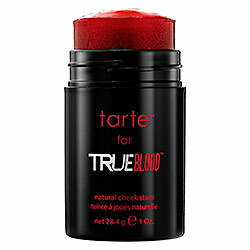 Tarte and True Blood have also created a limited-edition cheek stain to give you that flushed, just-bitten look. Tarte is known for their amazing cheek stains that last all day and compliment a variety of skintones and types. This extra sparkly, sheer shade contains natural mineral pigments and fruit extracts and seriously gives you a gorge. glow. Tarte for True Blood Limited-Edition LipSurgence Natural Lip Tint ($24.00) To complete the "just-bitten" look, you need to look like you've just bitten something! Try Tarte's limited-edition LipSurgence Natural Lip Tint. This yummy chubby lip shade is moisturizing, softening and has a delish. mint-infused flavor. The True Blood shade is seriously pretty on everyone and will be perfect to swipe during one of the many Halloween festivities I'm sure you'll be attending. The color draws attention straight to the lips, which could be quite useful on this extra saucy occasion. I love Tarte. They're an amazing paraben-free line that always delivers rich pigmented shades in beautiful universally-flattering tones. Get inspired by True Blood characters and their gorgeous vampy looks this Halloween! Looking for more True Blood Halloween inspiration? Check out vampire Pam's favorite lip shade. I love it too! Need some more Halloween makeup inspiration? Check out my favorite Halloween accessories. Check out Sephora's Halloween inspiration here. Check out Marie Claire's Hot Halloween Costume ideas! Hair Share: Favorite Products Right Now! Do Good Looks Influence A Jury?